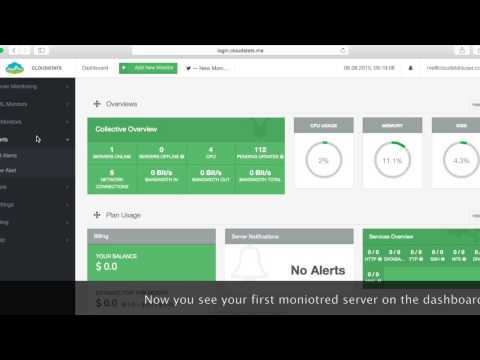 Cloud based network monitoring software that allows you to monitor servers, virtual machines, cloud and websites. Subscription that costs between $5 and $100. Price may vary depending on commitment and so on. CloudStats was added by cloudstats in Sep 2018 and the latest update was made in Mar 2019. The list of alternatives was updated Sep 2018 There is a history of all activites on CloudStats in our Activity Log. It's possible to update the information on CloudStats or report it as discontinued, duplicated or spam. Cloudstats seems to fill a void in the server monitoring landscape. It provides a simple but detailed monitoring solution that is easy to setup and doesn't cost a fortune. is a new linux server monitoring tool which is very easy to use yet capable of providing most vital information about your server. CloudStats was developed with simplicity in mind. Very very good system monitoring. Recommend! Hey, Guy I like this. I think it has everything i wanted for my servers, a simple but efficient cloud monitoring tool! I am new here. So, I need to check the services. If it can monitor the server up time, It will be great! Nice service, good UI, easy installation. Website monitoring seems to be quite seemless. I just signed up for the service, and within 2 minutes I was already monitoring one of my DigitalOcean servers. Cloud Stats is very useful network and system monitoring tool.it has very attractive web interface its very easy and simple. dashboard has most impotent it can customize. Very good interfaces and very easy to use and manage. Light and fast. It is a great set of tools! The monitoring interface is intuitive. It is easy to install, at least on Ubuntu servers. Recommendable! I have been using CloudStats for over 2 years now. to check on servers that are the backbone of my hosting company and just the feeling and useful of all they offer is great on the free plan. Just signed up and enrolled couple of my servers. Looking great so far definitely will rollout data center wide. I have been using CloudStats for a long time. It's a great tool to get notified when there is an issue. Perfectly meet the need with CloudStats. Monitoring solution w/o new infra implementation needed.